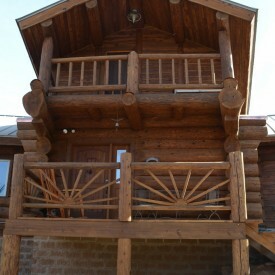 888-LOG-GUYS is your log home restoration company! We are here for you! We are the best in the business for you log home care needs. 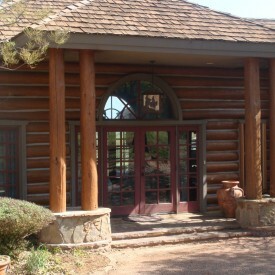 We also specialize in log home repair, log home chinking and caulking, log home improvement, and log home maintenance. Our experience and professionalism will impress you and result in your utmost satisfaction in our services. Our crew is available to serve you in the Cookeville Tennessee area. If you have problems with your log home or log cabin or if you need maintenance services, don’t delay. Contact us by phone or through our website! A log home or log cabin takes a lot of work to maintain! 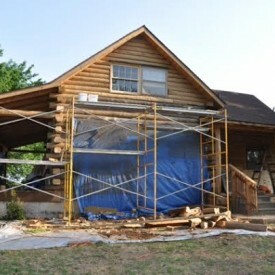 But, are you finding that your log home needs more work to be fully restored? There is no need to despair! We will save you time and money with our various log home restoration packages which include: media blasting (corn cob, glass, sand, and walnut blasting), sanding, cleaning with a borate treatment, chinking or caulking, and staining. If you feel your home needs to be rejuvenated to its glorious beauty, please call our number! Or you may request an estimate from our website! 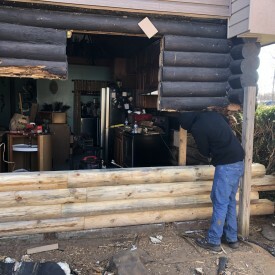 At 888-LOG-GUYS, we know that a damaged log not only looks bad, but more importantly, it compromises the safety of the log home or log cabin. 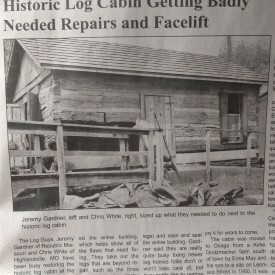 Our crew has repaired and even replaced many logs to restore the stability of the log homes they have serviced. Have you found some log rot? Have you seen insects infesting your logs? Have you noticed holes pecked by birds? Whatever the reason your logs may be damaged, we fix your logs and restore your home to as good as new! Without a reliable and properly-applied energy seal in between your logs, your log home may have some unnoticeable gaps that could let in the following annoyances: air drafts, water leaks, and bees or other insects. 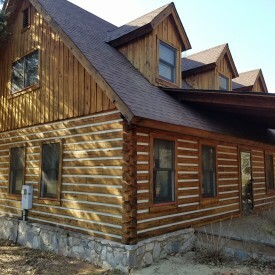 If you feel your log home or log cabin needs to have chinking or caulking applied, call us! If you think your current energy seal needs to be repaired, call us! Or you can ask for a quote online! 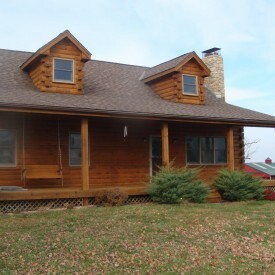 We will keep you log home or log cabin cozy and comfortable! Wow! You have an amazing log home or log cabin! And it looks great! But, you also have ideas on how to improve your log home and increase its value. Look no further than 888-LOG-GUYS to make your ideas become reality! We can build you a new deck or porch. We can construct that log staircase you always wanted! Our carpentry skills will help you get that log railing you dream of! Whatever you ideas are, ask us about it, and we would love to help you in the Cookeville TN area! No matter who has worked on your log home or log cabin in the past, we can come in and take care of the rest! Our staff is determined to see that your log home is properly cared for in a timely manner. We not only know how to clean and re-coat your log home, but we also know when to treat it next! We will be around to bring your mind at ease with the care of your log home in the Cookeville Tennessee area. You can call our number or request a free quote online!